Inside: …when you are in it. Inside: I give up! I'm all yours! Front: You are at the heart of my world. More Info: This unique card is designed with a diecut circular opening in which a square is suspended with gold string. 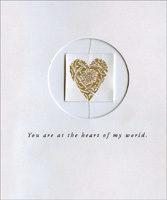 The square is decorated with a holographic gold foil heart that includes a flower illustration at its center. No additional postage necessary. Inside: I know I will love you even more than the moment it began. Inside: …whenever, wherever… forever. I Love You. Front: Meant for each other! Inside: Meant for each other, you and me, because it's very clear to see we fit together perfectly! And heart to heart, from now on, too, we'll share the joy of dreams come true, a world of love for me and you.